Buy 3BHK Independent Duplex Bungalow in Vanamamalai Nagar-Doraichami Nagar near Palanganatham-Arapalayam By Pass Road,Madurai. 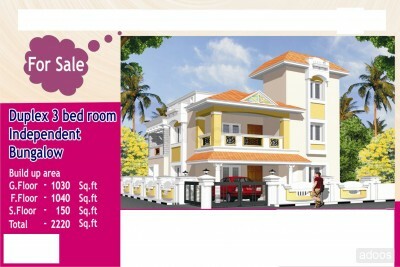 Plot Area: 3.87 cents; Building Area: 2220Sqft. Second Floor (150Sqft): 150sqft Room on Terrace. Age of the House: New. Location: 10 min Walkable distance from Palanganatham - Arapalayam By-pass road. Landmark: Value City Complex & Aparna Towers on Palanganatham-Arapalayam By-pass Road, Balu Hospital in Doraichami Nagar. * Complete White Marble flooring ; Granite flooring for Stair case, Balcony (Sit-out) & Kitchen. * All Doors & windows are Teak wood; Stair case handrails also made of Teak wood. * A/C points are provided for all bed rooms. * Pest control mixture used for flooring to avoid pests inside the home. * 16mm rods used for construction as in commercial complexes. (Normally 12mm rods are used in residential buildings). * 3-Ph EB Connection is provided for the entire house. DP Box used to avoid electric shock anywhere in the house.